It started innocently enough. The Tao, in his infinite wisdom, referred to Jose Bautista as the One Man Gang in a recent post. As it is awesome, I grabbed it with two hands and shook it violently over my head for all to see. It is almost too perfect, though some dissenters expressed reservations over the 80's wrestler association. Just because one guy on the internet doesn't jib with dead wrestler references (literally one. Al Gore created the internet with oblique shoutouts to Koko B. Ware in mind, I believe.) doesn't mean the nickname isn't nails. But then another guy took exception to the One Man Gang moniker, claiming it was inaccurate due to the Jays high volume of runs scored. While not qualified to address this poor guy's fun allergy, I can speak to the One Man Gangishness of Jose Bautista's assault on reason. With charts! When attempting to measure production in these terms, I went with wRAA - weighted runs above average. It's basically wOBA converted into a counting stat based on playing time. For example, Adam Lind rates highly in terms of wOBA but hasn't played enough to produce too much. The first image you see below is the top 10 offenses in baseball (not including last night's results) by wRAA compared with their highest volume producer. The results, well, they speak for themselves. One Man Gang! Let's summarize: Jose Bautista has actually created more offense than the Jays as a whole. His teammates actually bring the team's overall production down. Of the top ten offenses in baseball, only the Brewers get such intense production from one player, the awesome Ryan Braun. But wait, doesn't Prince Fielder also play in Milwaukee? Is he terrible this year and I just haven't heard? Nope, Prince is in a walk year and currently rocking a .395 wOBA so that ain't right. What the Hell? With that in mind, I went ahead and looked at each team in baseball's top two producers. 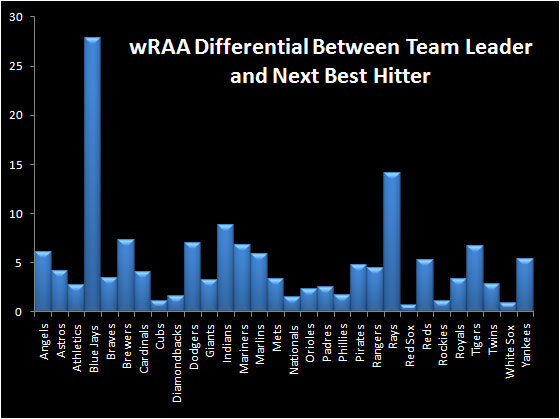 What is the greatest differential between the best guy and the next best guy for every team in baseball? SPOILER ALERT: ONE! MAN! GANG! Again I say it: ONE MAN GANG! Only Matt Joyce is even in the same neighbourhood of one man gangery. Jose Bautista is so, so much better than his teammates it makes my head shake. Which isn't to say the contributions of Yunel Escobar aren't greatly appreciated as they certainly are. 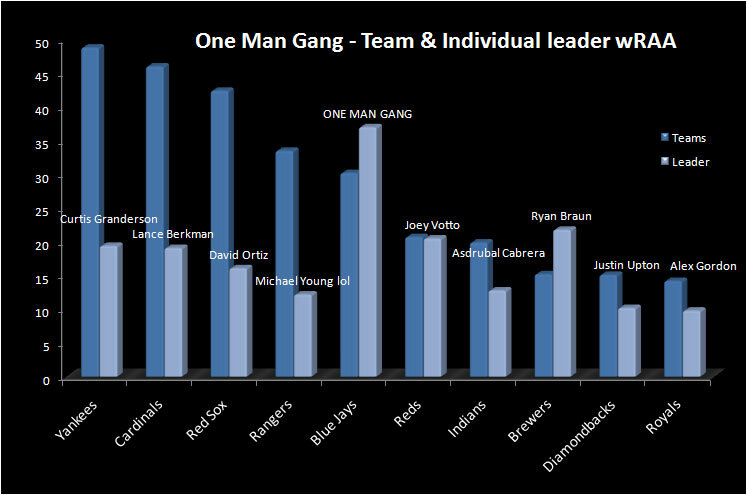 Yunel himself outpaces many team's leading producer in both wRAA and SWAG. But those teams aren't gangs. They're more like your ultimate frisbee team - just a bunch of tossers standing around in a park. When a single player drags his team — a team that turns to Juan Rivera to hit cleanup and Rajai Davis to lead off — into the top 5 in baseball, he certainly gets to wear the One Man Gang tag. With pride, one would think. Reuters image courtesy of Daylife, wRAA data from Fangraphs. He's so awesome it's stupid. Can you imagine this offence with Lind and even league average production from third base? Playoffs!!!!1? The Jays have a 2nd best hitter? I felt a tear welling up as I read this. I feel as though my flippant nicknaming has been given legitimacy.